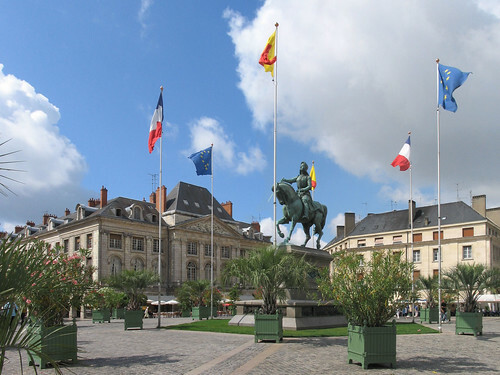 This is Jeanne d'Arc - or Joan of Arc - on the central square of Orléans, a city where I have been several times in my youth during school exchanges. Just good remembrances! And Joan of Arc's story is a great European tale including national rivalries, the role of the church, medieval Europe etc. She is also one of the few "heroines" that are celebrated among the "great" kings and emperors that dominate story-telling of European history. Orleans! Lovely, but weird the way it's turned its back on the river. Joan of Arc is my name saint in the bits of Europe that celebrate that sort of thing. Hers is an amazing story, but European? Well I guess so in the sense that it was anglo-french rivalry that brought about her demise? Orleans is just lovely. Been there and enjoyed it very much. I live in Orleans, Massachusetts, on Cape Cod, the only town on the Cape named for a place in France! Yes she is one of the few women that made it in the history books and mostly what people remember of her is that she got burned alive. sic. Yes, but she was burned because she was a woman who "dared" to go into male domain, because she was resisting and leading, going against authorities etc. I'd say that this is something that those who know that she was burned would also remember.